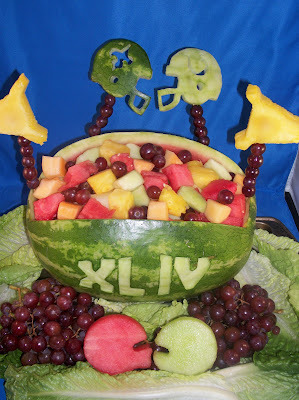 This is a fruit bowl I carved for a Superbowl XLIV party, complete with New Orleans Saints and Indianapolis Colts Helmets. 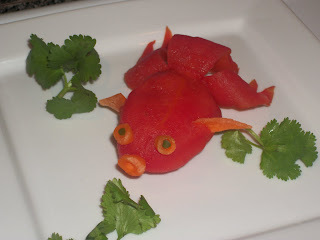 This vegetable carving is half a Roma tomato with the skin peeled back and cut to look like the tail of a goldfish. The goldfish's fins, eyes and mouth are made out of carrots and the green in the eye is cucumber.